One word to sum it up: Busy. While Wall Street is a portrait of corporate espionage and someone screwing over another, its also a portrait which gives the young a good idea of what the world was like back in 1987. There were those rather bulky computers which had the bottom line in graphics. There were those mobile phones which look more like cordless phones and probably couldn't fit in a pocket. And there was Charlie Sheen. Before Two and a Half Men and before the drugs and alcohol made him one of the most controversial figures today. So, basically, Wall Street perhaps isn't the best film for the young and ignorant to watch, because it simply maybe too unbelievable for them. Bud Fox (Charlie Sheen) is a Wall Street stockbroker in early 1980's New York with a strong desire to get to the top. Working for his firm during the day, he spends his spare time working an on angle with the high-powered, extremely successful (but ruthless and greedy) broker Gordon Gekko (Michael Douglas). Fox finally meets with Gekko, who takes the youth under his wing and explains his philosophy that "Greed is Good". Taking the advice and working closely with Gekko, Fox soon finds himself swept into a world of "yuppies", shady business deals, the "good life", fast money, and fast women; something which is at odds with his family including his estranged father and the blue-collared way Fox was brought up. 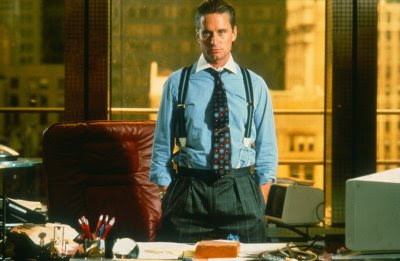 Wall Street is completely run by Michael Douglas and his towering performance as villain Gordon Gekko. Everything he does or says is just so scary. If you were to mess with Gekko, then you would probably be dead. I guess that's why Douglas got the Oscar. Gekko's cool demeanour also makes the character of Bud Fox interesting. Fox is an innocent being, but once he gets screwed over by Gekko, the decision he makes to retaliate is a very interesting one. Its like you'd have to resort to anything to take Gekko down. I imagine this movie would have been one of those 'zeitgeist' creations back in its day, but the movie has clearly had a resounding influence on some Hollywood films; most recently, The Social Network. Its themes of power, happiness, doing the right thing, and of course, greed are explored quite well. The backdrop being the money market only makes it more interesting. The film is filled with clever dialogue and a smart look at a smart landscape. Sometimes it delves into becoming an over dramatic piece of work, but all in all, Oliver Stone did a good job with portraying humanity at its worst. Unfortunately, the modern mainstream viewer probably won't take to it that much since it has seemed to age really bad. Considering the attention it should be receiving thanks to the sequel's release, this could be a problem. However, those who put themselves right into this movie will probably get the most out. THE VERDICT: A fearless portrayal of the money market in the 1980's, combining themes of power, revenge and greed perfectly. And it has that wonderful performance from Michael Douglas as Gordon Gekko.